We’ve been towing our Honda CR-V with the same towbar for over 13 years. All that time we’ve dealt with binding issues when trying to disconnect on curves or facing downhill. We figured that was just a part of RV life. A recent conversation with fellow full-timing friends led to a major change; further proof that you (or at least “we”) are never too old to learn new things! We mentioned to our friends that we were planning to make a video about the techniques needed to release a towbar on hills and curves. They looked at us like we were crazy, telling us they’d never dealt with that issue before. It turns out that the brand of towbar they were using, a Roadmaster, is an all-terrain, non-binding design that releases easily under almost any conditions, not just on the straight & level. We were on our way to visit Tough Top Awnings in Vancouver, WA, and Roadmaster just happens to be right down the street from them. So we stopped by to find out what secret we’d been missing out on all these years. We not only took a tour, but actually saw Sterling towbars being made (the top-of-the-line aluminum model our friends have). It was like an episode of one of our favorite shows – How It’s Made – come to life! Roadmaster has asked us to put one of their all-terrain towbars to the test. While we now have the same Sterling model our friends use, they have a whole series of “All-Terrain” bars designed to release at any angle. It was great to see that this type of industry is alive and well in the USA, and we’re eager to try out this impressive piece of equipment for ourselves. After some initial testing, happily unbound, we’re off to a great start! While our Blue Ox gave us many years of reliable service, we look forward to improving our RVing experience, free of a nuisance that we didn’t even know there was a solution for. Solar Panel Tilting: How Much Difference Does it Make? Do you have experience with / or a video of 5th Wheel Landing Gear motor / gear box replacement with how to instructions and/or ideas ? Hi Richard! Sorry we can’t be of much help with 5th-wheel-specific tasks, as we have no experience with them. The only thing we’ve ever done with 5th wheels is replace awnings and slide toppers, which of course isn’t specific to them. We’d suggest the user forums at iRV2.com. It’s free to join and post questions, and there are tons of RVers experienced in every aspect of RVing who are eager to help. And keep one other thing in mind: pretty much all towbar companies offer adapters to convert other-brand towbars to their baseplates, and vice versa. So if you have a Blue Ox baseplate, but a Roadmaster towbar… there are adapters for that. And vice versa. You’d never be “stuck” with one brand. But our experience with Roadmaster has been so much better than Blue Ox that we would never go back, as long as they offer equivalent equipment to meet our needs! We are getting ready to purchase a new tow bar for our new to us 2012 CR-V. The tow bar we will be getting is the Roadmaster A/T. I noticed on your video that after connecting the tow bar to your vehicle you backed the vehicle up to lock in the arm releases. With our other tow bar we pulled forward in the MH to lock the releases. With the Roadmaster A/T can the releases be set either way (backing the tow car or pulling forward in the MH)? Hi Alan! Congratulations on your new-to-you Honda (we love our CR-V!) and your upcoming tow bar purchase. Not sure what brand or model tow bar you had, but in all the years we’ve had both Blue Ox and now Roadmaster tow bars, we’ve never heard of using the RV to lock BOTH arms. Locking the SECOND arm, yes, but only if both don’t lock when hooking up, and backing up, the car. We’re confused about how well leaving both arms unlocked until pulling the RV forward would work in a downhill situation, since the car, when connected and fully ready to tow, is, by definition, in neutral, and rolling freely. If you were facing even the slightest bit downhill, without at least one of the two arms locked (by backing the car up), the car would roll forward toward the motorhome, fully or mostly compressing the arms. Then, when you begin driving the RV, still facing downhill, the car will just sit against the back of the rig until you reach an uphill, or at least more level, spot. The correct way to attach the car is to back it up until at least one of the arms lock (or both, if you get it nice and straight…. which we make it a bit of a game to attempt each time! LOL). If they both lock, you’re 100% good to go. If only one locks, you simply need to stay aware (in the back-up camera) of the unlocked arm until it does lock. If, for example, we gently back up the car and get the driver’s side arm locked, and the curb-side doesn’t, we’ll take it very easy until we get a chance to make a gentle curve to the left (typically still at parking lot speeds) until we see the curb-side arm extend and lock in. Then we’re good to roll. It’s important to be aware of that unlocked arm, as a sudden acceleration or turn to the left could rapidly extend the arm from fully collapsed to fully extended, with a BANG at the end as the arm slams extends rapidly all the way out. This would put a lot of unnecessary stress on all of the components, especially the arm that slammed out, and the baseplate on that side. CAN you pull the motorhome forward to lock both arms? We suppose so. But it’s not the right way to do it, and not sure why you’d want to. When you’re hooking up, you’re standing right there with the car anyway, and backing it up on the bar is just part of hooking up. Thanks for your reply. I guess we were lucky for 6 years in that I’m guessing we never hooked up in a severe downhill location. My wife always stays outside to check the brake lights and turn signal lights. Then I would pull forward several feet until the arms locked with her watching to be sure they locked and the wheels on the tow car were rolling – not skidding – that happened once. We will now back the tow car to lock in the arms. Wow! You’ve definitely been lucky to always hook up on the level like that, Alan! ;) Obviously, do whatever works for you… but know that backing up the car to lock one/both arms is definitely an option. We’ve done it for 14+ years and have never had a problem (and find it easier since we’re already back there working on the car to get it connected). But it’s still a good idea to have someone keep an eye on the car as you begin to drive away to check for the items you mentioned (steering unlocked, wheels turning, etc). I noticed you indicate that the 645 safety cables come with the Sterling all terrain tow bar. I ordered that item but the cables have a hook at one end and a soldered ball at the other end and not a loop. Can you explain. Pingback: How To Replace an RV Window & How It's Made! RVgeeks How-To Video. Great video! I bought the Blue Ox baseplate for my 2012 CRV about a moth ago and was waiting to get my RV before I got the towbar. I was going to get the Blue Ox that you replaced with the Roadmaster, but seeing this I ordered the Roadmaster. Question on the bracket at the toad side. The safety cables that came with the tow bar have the little ball end that is suppose to attach to the mounting bracket on the toad. This would not be the case with adapter to the Blue Ox baseplate. Did you have to get different safety cables for this install? Which adapter did you get for the baseplate? I think it is the 031-5, but not sure. Hi Steve! Excellent! We’re super happy with our Sterling. We’ve been really putting it through its paces, and no matter what we do, we cannot get it to bind! It’s such a breath of fresh air not to have to fight with it when we’re not disconnecting on the straight and level. We’ve been shooting a follow-up video with more detail and hope to have that edited over the next several weeks. These are the straight Roadmaster cables, and the beauty of them is that the ends without the spring-loaded clips permanently attached are designed to be small enough to slide through the channels on the arms. All you do is remove the oval-shaped rings (unscrew them) from the small ends of the cables, slide that end of the cables through the channels from the car side of the arms toward the RV, and then use the oval clips to attach the cables to the RV, where they stay. Now you just clip/un-clip the spring-loaded hooks from the front of the car when connecting/disconnecting, and the cables stay neatly in the towbar. Beautiful design. Of course the use of a Roadmaster towbar with a Blue Ox baseplate does indeed require the Blue Ox adapters at the car side of the bar, as we mentioned in the video. You are correct that we use 031-5 to connect our new Sterling to our Blue Ox baseplate. Hey guys, another great video and post. I have seen blue ox tow bars on many RVs going down the road and at Nascar races, etc. . I have started to make it my business to notice these things. I have also been on some blogs like IRV2.com where people tell their tow setup as part of their signature for the forum posts. I have seen mostly Blue Ox, so I had assumed incorrectly that this was pretty much an industry standard and if so many people were choosing it…. it must be the best. It wasn’t really something on my radar. Your post will make me take a much closer look at this in preparation for the day when I can hit the road full time. Thanks for the great quality in your videos. Roadmaster wasn’t on our radar before either. But it sure is now! We’ve been putting this bar through its paces, and have a follow-up video in the works. Suffice it to say that we have boon absolutely unable to make it bind so far. And we sure have tried! We’ve had that exact same one for over a year and it binds. We haven’t had that happen yet, David. Are you by any chance experiencing this when facing uphill? Not sure if you actually have the “All Terrain” model (don’t know when they started making that) or maybe you need a maintenance/cleaning? Just thought we’d add this latest related info. I have had the RM Sterling tow bar for about 12 years now. While it is better than our previous RM Falcon tow bar, it still binds up on us in sloped conditions. We live on a street with a slight uphill grade, so we have to force our toad forward as you did, every single time we unhook at home. It is an older Sterling, but it does have the Freedom Latch, so I am left wondering if the Freedom Latch has been re-designed since my purchase. I’ll have to put a call into RM. Too bad there’s no “RV Geeks Discount” on a new one, LOL! Regardless, thanks for yet another fine video….without it, I would’ve just figured that this was as good as it gets! Hi Craig! Because your street is on an uphill grade, what you’re experiencing isn’t actually the towbar binding. On downhill grades the pressure of the car against the RV can cause the latches to bind due to the weight of the car pressing forward. But in an uphill situation, there isn’t actually any towbar on the market that will allow the car to disconnect without snugging it forward against the motorhome first. If your towbar is binding in other conditions besides uphill, you may want to ask Roadmaster about periodic maintenance, which is required with any towbar to keep it in top shape. We’re planning an upcoming video about the experiences we’re having with our Sterling (so far, so good!) and plan to include details about connecting and disconnecting in both uphill and downhill situations, and how to allow one-person operation in virtually any condition. Stay tuned! By the way… sorry we weren’t able to arrange a discount on this one, but that’s because Roadmaster doesn’t retail their products. Thanks for the video and the explanation about this tow bar. After we looked at the video and read all the comments we decided to go ahead and buy this setup. We first thought about using a dolly but that seems to be a pain to load, unload and store. It is however 50% less cost. The next decision was a breaking system because our Buick LaCrosse 3.6L 6 cylinder weights a little over 4000Lbs. To save on installation cost we chose the Blue Ox Patriot system, a portable breaking system with wireless controller in the coach. The thing we are not sure of as of yet is how to go about the tow lights. I know the break-lights will work because of the Patriot that pushes on the brake pad but nothing activates the signaling lights and the tail lights or license plate lights. I did see some lights with magnets to put on he back of the car and cable up to the coach, that might be the way to go. Again thanks for this valuable info and keep them coming! If you determine that you can flat tow your car, then the towbar choice is a good one. We suggest basing your plans for the brake lights on your plans for the car… as in how long you plan to keep it, how often you use it (are you full-timing or just weekending a dozen times a year, etc). The more often you’re out on the road, and the longer you plan to keep the car, the more sense it makes to do a more permanent solution to the braking system and lights. For example, we planned to keep our car for many years for full-time use (which we have done). So we had a braking system and lights permanently installed. So we have almost nothing to do when we connect and disconnect, as the braking and light system is invisibly integrated into the car. We simply connect an electrical umbilical from the RV to the car when we hook up. No bother at all, no lights or braking system to move or set up. If you RV only occasionally, or don’t plan on keeping this car long-term, that would have us leaning toward a less-permanent installation. We are weekenders for now but that might change. I’m convinced that when we decide to go full time the portable breaking system can be sold easily to make room for a permanent breaking system. Labor for that is an estimated 8 hours. (Add $960) Until then it should work. I’m handy enough to do the wiring myself, that should not be a problem. Wow Klaas! It sure sounds like you’ve done your homework, and have a great handle on the best way to go. Hope you have a satisfying time getting all this set up and using it out on the road. One other note, Klaas. Typically, even in the 7-wire-to-6-wire cables, there is an extra wire available for use as a charging wire. For example, look at this document (PDF) from Roadmaster: http://roadmasterinc.com/pdf/85-5303-00.pdf. In particular, see Figure 3 on page 2. Because a lot of cars (or auxiliary lighting kits installed into towed cars) have combined stop/turn lights, not all of the wires are needed. So in Roadmaster’s situation, Pin #4 on the 6-wire (car) side is still available as a charge cable. Don’t know how the wiring would all work out in your car, but even with a 7-to-6 conversion, you should be OK.
That is the exact PDF I was looking at. I bought a kit that includes the bracket, tow bar and the cabling that including the diodes. My car has all lights separate and the RV as well. The schema is easy to follow and only uses 5 wires so leaves me two for other uses. Now the biggest trick is to route the cable to the back of the car. I will ask the dealer too, they are very responsive and willing to help with some directions. I used http://www.hitchsource.com to buy all of this. Their prices are great. Everything is shipped and on its way. Thanks for the great information on releasing the tow bars. However, the more important question is where were you camped out in the desert? Looks like the Trona pinnacles area? We have the Roadmaster All Terrain towbar. Overall we are pleased; however, it still binds as evidenced by having my DW jog our toad to release tension when occasionally unhooking. We have encountered this too often especially on uneven RV Sites. This is the first report we’ve received of this, Vincent, and exactly what we will be evaluating and attempting to replicate in our use of the Sterling. We’re aware that all towbars require periodic maintenance. May I ask if yours has always had this problem since new, and if so, have you spoken with Roadmaster about it? If not, is it possible that maintenance might be due? We have this same towbar and over the past 6 years, it usually binds about 75% of the time, regardless of whether we are down or uphill, straight or on an angle. Another RV, with a similiar problem with this towbar, told me to pull a little forward to take the tension off the towbar or turn the wheels to the right or left. This works approximately 50% of time. I never heard of reverse and I will try that next time. Hi Dennis! Just to be clear, are you talking about the Roadmaster Sterling binding… or our old Blue Ox? In our experience with the Blue Ox, there are two things that can bind… the release mechanisms on the towbar arms, and the clips that attached the towbar to the car. When facing downhill, our Blue Ox bar bound in both places due to the weight of the car pressing forward against the RV. This required a helper to back the car away a little to take the pressure off while simultaneously pressing down on the release arms. Then letting the car roll forward a foot or so takes the pressure off the clips on the front of the car. Set the brake and all is well for disconnecting. On turns (car not straight with RV), the release handle on the inside of the turn binds, since there is pressure forward (car & RV pressing together), just like on a downhill. This also causes that inside bar to bind at the clip where the car attaches, for the same reason… vehicles pressing toward each other (compression). At the same time, the outside release arm can be easily pressed down, but the clip on the car usually binds because of the car pulling so hard AWAY from the RV, preventing removal of that clip. This is the situation we showed in the beginning of the video, although we did not show how the clips bind, just the one release arm. Didn’t seem relevant for the video, since the action required to release the inside arm (rocking the car back) simultaneously corrects the problem with the clips binding. In both of the above situations, our Roadmaster Sterling has not let us down yet in the short time we’ve been using it. The nice part about the ease of release of the arms is that is also releases the pressure of the clips on the car…. assuming that it’s FORWARD pressure that’s binding those clips (i.e. car pressing toward the RV, as in downhill or the inside arm during a turn). The last binding we encounter is one that no towbar that we know of can solve without a helper… facing uphill. The pressure of the car pulling away from the RV allows all towbar handles to release easily (even “non-binding” models), as there is no pressure compressing the car toward the RV. But since it is pulling hard away from the RV due to the gravity of the downhill behind the car, the clips will not release at the car. This requires a helper to pull the car forward a foot or so while the other person holds the release arms to allow the car to come forward. Then set the brake and disconnect. After we’ve had some time with the new Roadmaster bar, we’ll have to do at least one or two more videos about it, comparing it to our old one, pros & cons, etc. We’ll also talk further about these details, once we have time under our belt with this new one so we’ll be more thoroughly knowledgeable about both. Are you sure your model is one of the all terrain ones (don’t know when they started making that) or maybe you need a maintenance/cleaning? Just thought we’d add this latest related info. Fortuitous timing – I’m looking for a towable vehicle (ours isn’t) and tow bar right now. I have read up on other brands but now, thanks to your video, I can narrow my search to the Roadmaster. Bonus that the factory is only 6 hours away. Did David (or anyone else at Roadmaster) give any hints about letting you offer an RVgeeks discount? That’s great to hear our timing is good for you, John. 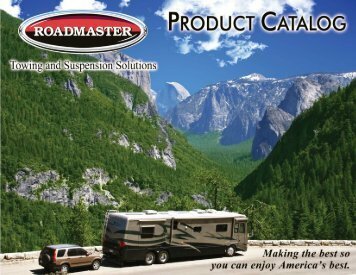 Unfortunately, unlike other great companies that offer discounts for us, like M4 and Tough Top Awnings, Roadmaster doesn’t sell retail. So they don’t really have a way to offer any discount, since they’re not selling directly to the public. Believe us, we thought of it, and wish it were otherwise, since we love being able to arrange that whenever possible. The good news is that everything we’ve seen and heard in our research about their company and products (you can already see the positive things people are saying here in the comments), tells us that they make great products that will really last. This is totally awesome. Well done guys! We bought our toad (a Mini Cooper) from fellow RVing friends who already had it setup for Blue-Ox. So that’s what we went with. We didn’t do any research into this stuff, and just thought ‘this is the way it is’. We had heard the term ‘non-binding’ before (likely from the same friends), but never really understand just what that meant. We’ve only had a couple binding issues over the years (one recently with an urgent disconnect need after discovering we weren’t going to quite make the turn.. so thank you for including your tips anyway). Argh.. so annoying! Thankfully, it doesn’t happen too often, being that we essentially are towing a roller skate. And I can usually single hand connections and disconnections myself. But after seeing your video, we’re impressed. The channeled wiring is super cool too. Had no idea they had adaptors to the Blue-Ox base plate. That’s even more alluring. So, consider us intrigued should we ever be in the market to switch in the future. We’ve been in the same boat…. just figured that sometimes having to fight to release the car from the towbar is just par for the course. When we arrive at an RV park, before one of us goes inside to check in, we always walk to the rear of the RV together to see if one of us can disconnect alone (as in checking to see if either one or both of the handles are jammed). Looks like we won’t need to do that any more. Hope you and Chris are having a great pizza night! Never had a binding issue with our Roadmaster All Terrain. And it is so easy to connect and disconnect. Very good. I didn’t know Road Master made such high quality equipment. Keep up the great videos. I’ve been watching you guys for a few years now. And good luck traveling in the future. Hope to run into you guys one day…. They make a super product…. Good to hear, Rudy. Sounds more and more like we’ve hitched our wagon (sorry lol) to the right company. We just started towing a 2011 Jeep Grand Cherokee with a new Aventa LX towbar. I came across a video on YouTube showing how to release the binding issue I’ve experienced a few time saying that if you turn you steering wheels opposite of the arm you are trying to release you can raise up the toad a bit and usually hit the releases and they free up. Is this the same situation that you are describing? The guys at Roadmaster are top-notch. We have been to the factory twice for installation work. They have an excellent product line and have always gone above and beyond with our work. When you see the pictures in the owners manual for the 2016 Jeep Wrangler, that is our Jeep. Thought I would drop you a line to tell you that I enjoy all the articles you do. When we got out first tow setup, the installer chose a Road Master All Terrain for us. I am proud to say it has worked great thru two toads and four motorhomes and other than minor maintenance and cleaning, has worked great. Thanks for the nice comment! Glad to hear your RoadMaster towbar has been working well for you all these years. We’re looking forward to more enjoyable use from ours, too! I’ve owned a Roadmaster Falcon II for 12 years; it’s a couple steps below the Sterling you have. My 2008 Jeep Wrangler has an automatic transmission so I can put the car in reverse then get back to unbinding the tow bar. Not a perfect solution, but I’m able to do it safely. When you report back with your update, I’d love to see some maintenance and longevity pointers as well. It seems like I should be doing a bit more to my Falcon II than the basic lubrication Roadmaster recommends on their website. Thanks for the new video. Interesting solution to put the car in reverse and leave it while releasing the towbar. Of course that’s not an option for us stick shift types. Yes, binding when not perfectly straight is a real pain. fyi, the Blue Ox Aventa LX Towbar also offers a “no bind” release feature. One of these two units is in our future.